The large 12 gallon Carpet Extractor allows operators ease of transportation with Heavy Duty front casters and large rear wheels. This Carpet Extractor allows for effective stain and spot removal. Dual vacuum motors provide exceptional drying of carpet after cleaning. This stainless steel extractor wand is easy to use and adjust for operator comfort. 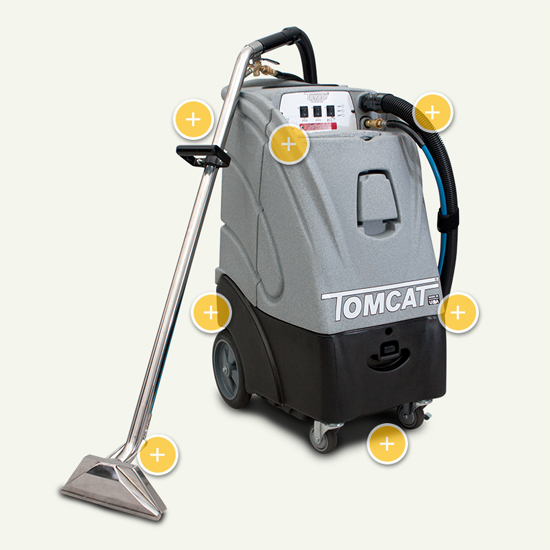 Provides exceptional drying and has dual brass spray jets. The front clear part of the tool allows the operator to see how much dirt is being removed from the carpet while its running. This full Stainless Steel hand tool is the best for deep cleaning. This tool provides maximum rigidity while performing exceptionally.